I started something I couldn’t finish. It seemed quite easy at the very beginning. Is it possible internalizing the knowledge? I started with my seated meditation experience in the library, sitting and mental traveling – I searched for the conflict between sitting and acting of the mind – I pondered how I could visualize this. Guess what? I failed. My mind was too fast and my body couldn’t be a part of the library as I scan the body with the mind. Very close to giving up, I gave a sigh and suddenly a vision appeared before my eyes, misty and smoky: Voltaire was there. Not a surprise. He smoked deeply. As he exhaled, “The delusion of the book-burners is the belief of being able to initialize the history and destroying the past…”, he said, through the fog. And then he disappeared. Of course he did. All of a sudden, as expected. “Is reading dangerous?” I asked Voltaire. Voltaire? He wasn’t there. But his voice was still in space, saying something like “erase your face and be a shadow and move through history”. Disappearing gradually, the smoke left a trace. A trace which has the might to transform the so-called erased face into a scarface. Well, that wasn’t a trace really. A knife was it, a utility knife. Its act may be a trace, maybe not, may be. Then it started to go on very easily and quickly- cutting books with the utility knife, making a rectangular hole. 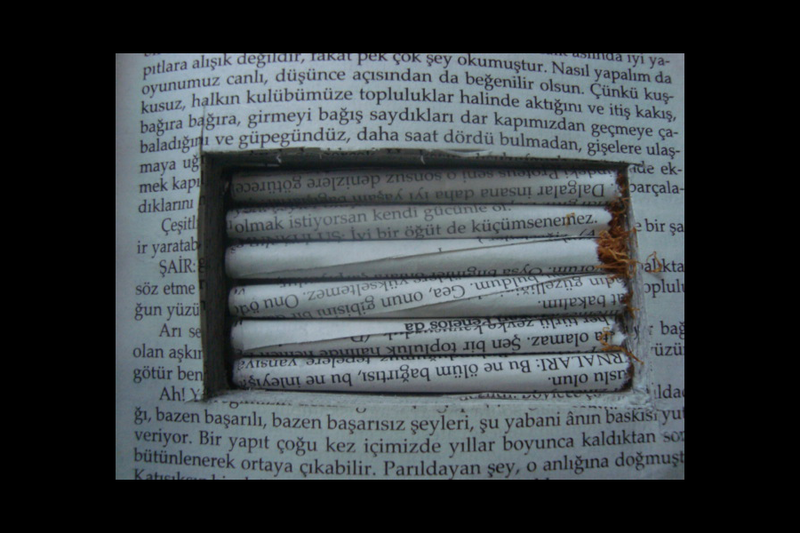 The hole may be the belly, so that the book could breath. Cutting more, more and more, constantly leaving pieces of papers, rectangular pieces. Rolling papers, filling them with tobacco, or with some weed, maybe not, may be, rolling again and again. Feeding the belly with fresh rolled novels, my hands becoming a rolling machine. Ready. Ready to read, ready to smoke or even to look. Call it a journey. A journey of a book, before it gets smoked. Enjoy the ride.